Everyone knows that if you want to practice your climbing out of season, your best bet is to try a climbing wall. But what if you want to practice your ice climbing? Obviously you can’t just slam your axes into the wall! This is where dry tooling comes into play. Dry tooling is climbing a route with ice axes, but no ice. When done outside, the axe is hooked over rocks or in cracks, but inside we have specially-designed holds to mimic these features. Whilst dry tooling won’t help improve your swing or your gear placement, it definitely works on your balance and strength, and you’ll notice the improvements when you get back out on the ice. We’ll look at specific techniques later on, but generally speaking, dry tooling is a challenging balance of strength, balance, delicacy, and courage. As the axes extend your overall length, every movement you make below them is greatly multiplied at the tip of the axe. Few things are scarier than your axe popping off the hold, sending you spinning backwards into space! For the same reason, footwork is really important. If one of your feet slips even an inch, you could find your axe skidding off the hold unexpectedly. Because of these factors, dry tooling is a somewhat slower and more controlled ascent than regular climbing. This is where courage and strength matter. If you don’t commit to each move, you won’t be putting enough force through the axe, leaving it only lightly touching the hold, and thus much more likely to slip out of position. It’s always scary putting all your faith into something that feels so wobbly, but the more you commit, the less likely you are to fall! And if you do happen to pop off the wall, you’ll be so focussed on the move you were trying, you won’t have time to be scared before you’re lowered safely back to the floor! If all of this seems like a crazy exercise for crazy people, you’re right! But if you’re still reading at this point, clearly you have just enough crazy inside you to be curious, and that’s all you need to give it a go! Here at Rock and Rapid, we set dry tooling routes on the last Friday of every month. We normally set a couple of different routes; an easier one to get people accustomed to the axes, and a more challenging route for those people who are feeling brave! We also set dry tool traverses so you can practice your techniques much closer to the ground. So, you’re curious about climbing with axes. But how do you actually do it? We know the axes are placed on/in the hold, but how do you use them best to your advantage? Well, the first thing we need to consider is that axes aren’t our hands. They cant grip, and they reach much further than we can with empty hands. Whilst this can leave you feeling unstable, like you’re hanging off of a tiny edge of metal (which you are), once you’ve cracked the basics of how to use an axe, you’ll find them almost as versatile as your hands! Ice climbers tend to work on two main points; the triangle, and the rule of 90s. When climbing ordinarily, we tend to be relatively square to the wall; our right hand deals with holds to the right, left hand with holds on the left, and when stable, the climber’s hands and feet will make the corners of a square or rectangle. There are times when you end up twisting or crossing, but where possible, climbers will climb square on. It’s simply the most logical way to move up a wall! When climbing with axes, this won’t work as well. If your right axe is out to the right, your body weight will be pulling it in towards the left, or else forcing you into a ‘barn door’ (where one side of your body pulls away from the wall, leaving you swinging like an old door). The easiest way to overcome this is to form a triangle instead. Your axe should, wherever possible, be directly above your centre of mass, with both feet moving up to the same height. Any time the axe is pulled at an angle perpendicular to the hold, it’s likely that it will slip straight off the top. This makes it hard to use climbing techniques like laybacks or flagging. This is where the rule of 90s come in. Any time your axe is placed, the blade of it should make a 90 degree angle with the positive side of the hold; if the hold is directly above you and perfectly horizontal, your axe should hang straight down perfectly vertical. This ensures that the weight is being directed straight into the best part of the hold, and is unlikely to slip. You also want the flat of the axe at a 90 degree angle to the wall. If it’s twisted to either side, you again risk having your axe pop off the hold. Finally, you want to ensure that your wrist makes a 90 degree angle with the handle of the axe. Whilst ice climbing, you will need to bend your wrist to get enough momentum to penetrate the ice. As dry tooling doesn’t require you to swing the axe, you can keep your wrist strong and straight. This will help to keep the axe stable; as mentioned in the last post, the added length of the axe means that little movements at the handle end are multiplied at the tip. A strong wrist ensures that the axe doesn’t move unless you want it to. These are just some of the basic principles of climbing with tools; there are many techniques and tips to learn to become truly proficient! Check in next week for all the information you need about tooling techniques! And in the meantime, why not come down and put all the information in this post into practice on the wall? There’s always an instructor about to shout encouragement and beta, and we can provide axes. Besides, our coffee is amazing. 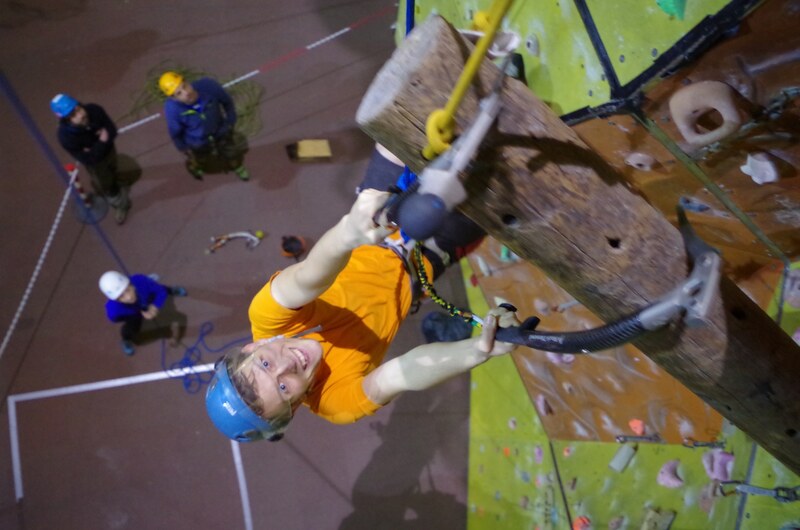 Our dry tooling nights are held on the last Friday night of every month. We are one of the only climbing centres to offer indoor dry tooling in the South West! 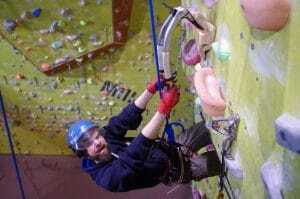 To find out more about dry tooling at Rock and Rapid, simply contact us on 01769 309002. Isaac is a rock climbing instructor at Rock and Rapid. He sets many of our dry tooling routes, and you’ll often see him hanging around from metal chains with ice axes on dry tooling Fridays. Pop by this Friday and try out his routes!